The skunk population seems to be more active than usual this year in the Chicgoland area – as noted by their distinctive odor that I have noticed around our house and on walks. I also have a 4″ diameter hole in the front lawn that I think is a skunk digging for grubs – the latter having destroyed much of the front lawn this summer. Climate change again? As a consequence, I am hearing of numerous dog-skunk encounters where the dog always comes off worse. Our Porty has been skunked twice in recent years and both times I have used the formula that works best. But there are few nuances here that you need to heed in order to get rid of the odor most effectively. The two skunk incidences were in very different circumstances which allowed me to do a sample size of n=2 experiment. But I think there are some useful insights coming up. Those tips are after the recipe. 2 tablespoons of Dawn detergent liquid. Other detergent liquid may work – but I have never tried it. Now for the important part. The first time the Porty was skunked she was off the leash and insisted on chasing the skunk across a grass field while snapping at its rear! When she finally caught up with the skunk, the inevitable occurred and she came running out of the bushes snorting and rubbing her snout and head on the grass (sound familiar?). As we were living in an apartment at that time, while our house was been renovated, I had to put her into the station wagon, my wife got the formula from the web, then drive to the drug store to get the supplies and then take her to the house basement and start to apply the mixture. Fortunately we had a large plastic dog bath in which I could place her while applying the mixture. All this meant that there was a significant delay between the actual skunking event and application of the formula. This happened between 11 pm and 2 am on a work night – Uggh! The second time the Porty was skunked was under very different circumstances. I just opened the side door for her usual late night bathroom visit. I should have known better because as soon as I opened the screen door I smelled a sunk but it was too late. She had run out by my legs, went straight into the bushes and zap! Right into the face again. But this time I had all the supplies shown above ready to go to work. I was able to keep her outside, while avoiding to touch her until I had on my rubber gloves. Try to avoiding touching your dog because the skunk oil will stay on you and then will transfer to anything that you touch. And you do not want to get it inside the house – it will stick around for quite a while. Using my gloved hands, and with the mixture now on the drive way, I could liberally apply the mixture to her skunked head. You then need to leave it in place for 30 seconds to a minute. Some recommend longer, but practically you may find it hard to keep the dog calm and still for much longer. But NOTE – do not get the mixture in the dog’s eyes. My dog was pretty calm and closed her eyes when I was applying (I used a sponge). Then copiously rinse with water. I used to garden hose on the driveway so this was pretty easy. I then repeated this one more time and then ended up by using her doggy shampoo to give her an overall shampoo and rinse. Then I used an old towel to dry her down (throw that away). Hose down the drive way. Done. In the first instance the skunk oil was allowed to sink in and somewhat dry. This formula and method helped in that situation but the smell persisted for days to weeks, despite daily shampoos. It will seem worse when your dog gets wet for any reason also. In the second instance, when I was able to apply within 15 minutes, she was almost free from odor. The house did not smell at all, she was able to come into the house that night, etc. By the way, do NOT rinse your dog with water to try to wash off the odor before you apply the formula. It will just spread the oil further on the dog and onto the area around the dog. 1. Stay calm – do not PANIC. 2. Act fast! 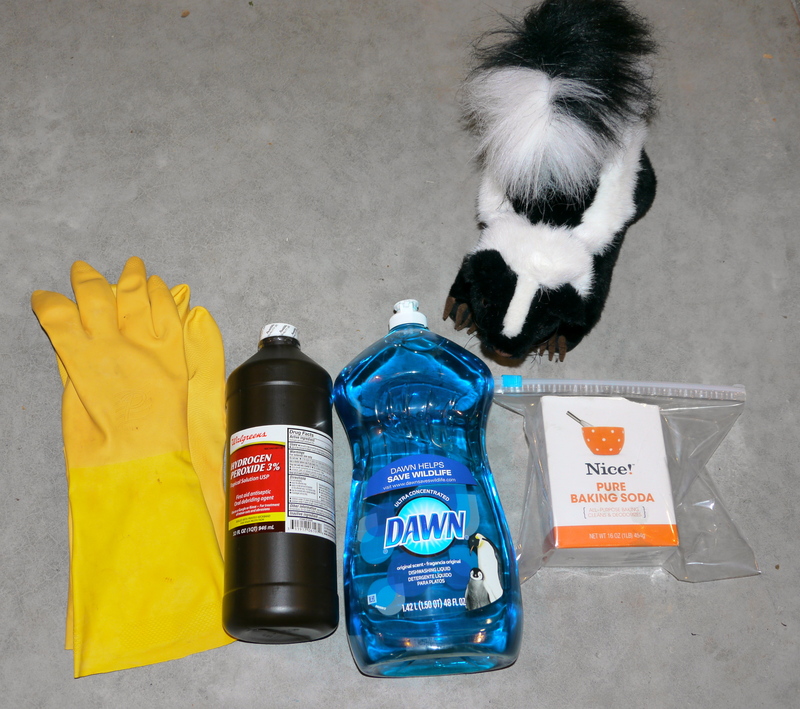 Have you skunk supplies at the ready somewhere convenient along with the recipe. Don’t forget the rubber gloves. 4. Apply the formula as soon as possible. Praise your dog and speak in kind, calm tones. 5. Apply the formula twice and then shampoo the dog afterwards. This entry was posted in Miscellany and tagged baking soda, dawn detergent, dog, hydrogen peroxide, skunk, skunk odor, skunked by hankinsonholmes. Bookmark the permalink.